I'm staying out of this one! Full of class. Should've morphed the "c" into an "n", too. How could anyone resist being a Republican when they exhibit so much class? It's a political cartoon. These type of cartoons have appeared on the editorial pages of newspapers in this country for as long as the ability to print them has existed. This is different only in the media it is displayed on. It's not surprising as the readership of newspapers has declined to a very small percentage of the population. The print media should be thrilled with this one as they can print photo's of this billboard and it doesn't have to be on the editorial page because it's "news" and they don't have to pay the artist for the same reason. I know what you mean. I think the Democrats are so outraged about this because they had never put out any unflattering material about Bush. Last edited by Parallax; 10-15-2010 at 09:15 AM. Can't believe they forgot Lizard Person, really. I can't believe they forgot Obama as Hitler and/or Stalin. Also surprised Pelosi wasn't shoehorned into one of the rat caricatures. I'm sure this will offend the real gay Mexican mafia terrorists. The sign along an Interstate 70 business loop in Grand Junction drew criticism from local Republicans and Democrats. The artist, Paul Snover, of nearby Loma, says he has received what he calls "very hateful" e-mails and phone calls. Snover has said he couldn't reveal who paid for the billboard. The Daily Sentinel said he couldn't be reached Friday to explain why it was removed. Too bad it's down. The political cartoon has long been a standard feature on editorial pages on newspapers for years. Now that papers are vanishing, it looks like the political cartoon may vanish also along with freedom of speech. Everyone talks about how important a free press is but if the papers die out, will that freedom still exist? I guess billboard signs don't fall under freedom of speech. 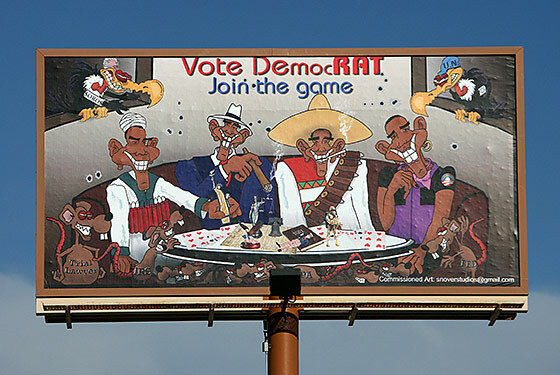 How many of those political cartoons have depicted the President of the United States in racist imagery? Or as a pimp? Or as a homosexual? Where is the line?